The record is made up of 1 volume (263 folios). It was created in 1917. It was written in English. The original is part of the British Library: India Office The department of the British Government to which the Government of India reported between 1858 and 1947. The successor to the Court of Directors. Records and Private Papers. middle part of the W. shore of Lake Urmia. Alt. 4,400 ft. Pop. a line from Tabriz via Khoi and Dilman). Wireless station. mosques, and a busy bazaar. 30-45 m. broad from E. to W., the dimensions varying greatly as , ■"
are a large number of small islands. The water is excessively saline. sterns, of about 20 tons burden, carrying a very large square sail. burning by the natives to prevent the pollution of the streams. 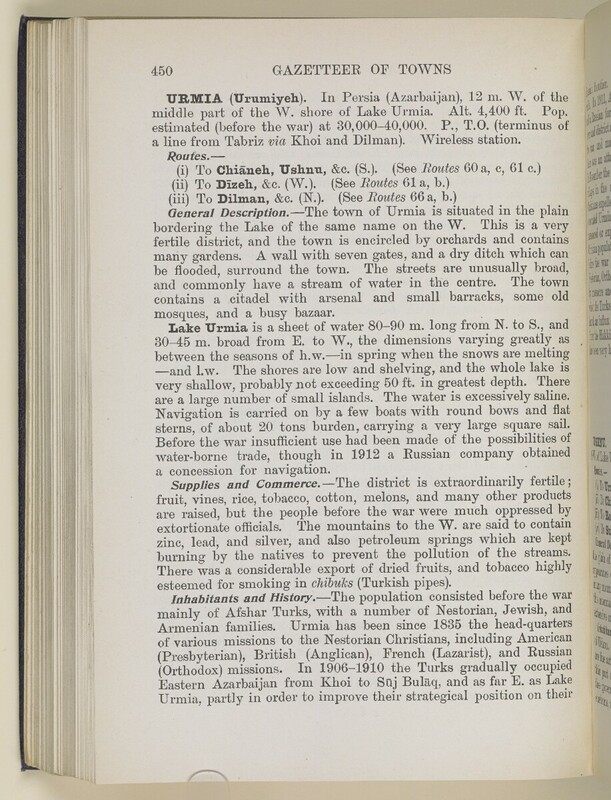 This volume is A Handbook of Mesopotamia, Volume IV, Northern Mesopotamia and Central Kurdistan (Admiralty War Staff Intelligence Division, April, 1917), covering Mesopotamia north of the line joining Rowanduz, Mosul, Meskeneh [Maskanah], and Aleppo, up to Van, Bitlis, Diarbekr, and Mar‘ash. The volume was prepared on behalf of the Admiralty and War Office, and appears to be based on official and unofficial publications and maps which are cited in a bibliographical section in the volume. The volume contains 15 plates, which illustrate the content of the various chapters, and 1 map entitled 'Mesopotamia: Outline Map Showing Routes'. The volume is arranged by numbered routes. There are pages of contents, an index, and a list of plates. There is one map house in a pocket. Foliation: The foliation sequence commences at the inside front cover and terminates at the inside back cover; these numbers are written in pencil, are circled, and are located in the top right corner of the recto The front of a sheet of paper or leaf, often abbreviated to 'r'. side of each folio (except for the front cover, where the folio number is located on the verso The back of a paper sheet or leaf. ). Pagination: The volume also has an original printed pagination sequence.